Posted by M Bharath Bhushan in elections, politics, Telangana. New Delhi/Hyderabad, Sep 28 — A day after the Andhra Pradesh Chief Minister urged the Congress leadership to take back the decision to bifurcate the state, party general secretary Digvijaya Singh Saturday said there was no question of a rollback. He told reporters in New Delhi that the Congress Working Committee (CWC) took a decision after consultations with all and after near-unanimity among all political parties. Digvijaya Singh is also in charge of Congress affairs in Andhra Pradesh. Posted by M Bharath Bhushan in BJP, Congress, elections, Telangana, TRS. While Seemandhra is still a cauldron. It is a role reversal where Seemandhra historically enjoyed economic advantage while Telangana suffered. 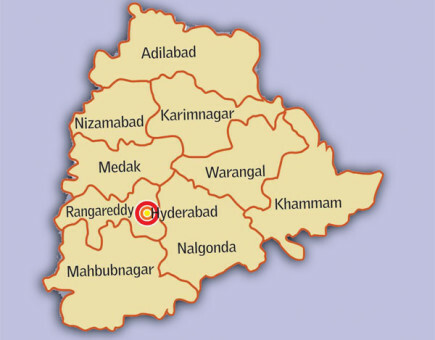 Hyderabad: While 13 districts of Seemandhra region continue to burn with unabated agitation for keeping the State united the Telangana region is witnessing a different situation altogether. The announcement of creation of a Telangana state has prompted key political parties in the region to devote their attention now in strengthening their base. Posted by M Bharath Bhushan in Congress, elections, TRS. The Congress game plan is calculated to stun its rivals. It seems plausible to come up with an enough number from AP to make Rahul Gandhi PM, if the new strategy is put in operation. Hyderabad: Ever wondered why the Congress is not worried at the anger being levelled against it by the Seemandhra? It is a gameplan that is aimed at coming up with enough numbers in favour of Rahul Gandhi. While grim is the forecast for the Congress prospects in Seemandhra party leaders take a different view. They say the anger against the party in Seemandhra for creating Telangna would only do it good as the party hopes to sweep the Telangana region in the next general elections, pushing out the T champion the TRS. Posted by M Bharath Bhushan in Congress, elections, Identity, politics, Telangana, TRS. New Delhi: The Union government on Friday rejected the contention that it has developed any second thoughts on the issue of Telangana, saying that the process with regard to its creation is underway and won’t be affected by assembly elections in five states. On 2 September, Home Minister Sushilkumar Shinde had said that a note to initiate the process of carving out Telangana would be presented before the Union Cabinet within 20 days but it did not come up in the Cabinet meeting on Friday. Asked whether it was an indication of the government developing second thoughts on the issue of separate statehood, Information and Broadcasting Minister Manish Tewari said the decision on Telangana stands. Posted by M Bharath Bhushan in Andhrapreneurship, Culture, Identity, Media, Telangana, Telugu. Andhra Pradesh’s media landscape has become such a chequerboard of affiliations that the politically aligned mediascape in Tamil Nadu pales in comparison.